Burgers burgers, everywhere. London's love affair with all things Americana shows no sign of slowing down any time soon and it seems that every corner you turn, you'll find a rib shack, burger bar or BBQ rustling up buns of varying degrees of success. The Burger Awakening only struck me a year or so ago so I'm a little slow on the uptake of the various outlets but the only one on my list worth writing home about (and revisiting) is MeatMission. Until now. Le Bun is stealing the show. Fresh from winning Sky and Samsung's Launching People and a two month residency at the Old Bengal Bar, Le Bun have taken over Dalston Pub The Three Compasses to offer fast food French-style. Last night was their launch party, and with the promise of great food, 50% off and killer tunes, it was suitably rammed. With no time to lose, we did what four sensible people do when offered six options - order one of each and dive right in. I kicked off with the Le Bourguignon Bun (I was swayed by the promise of bacon salt, champagne slaw and truffle mayo) and practically inhaled it, it was so good. The slow-cooked meat was deliciously melt in the mouth with a great depth of flavour from the glaze; crunchy cabbage slaw added that bit of tang and the saltiness from the bacon and truffle rounded everything off. The rest of the team didn't even get a look in. Le Duck Frites Bun was equally as sumptuous with crispy straw fries packed straight into the bun, whilst Le Chevre managed to serve up a whole wedge of oozing goats cheese, topped with that biting crunchy slaw for good measure. 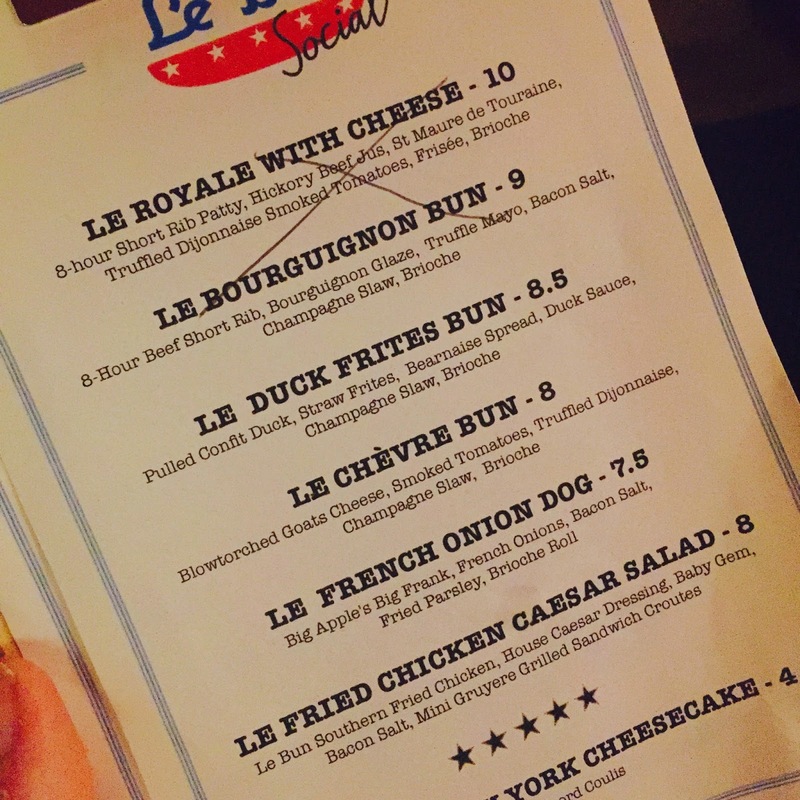 Le Royale With Cheese sold out pretty sharpish and passed the boys' meat test (ie. plenty of it) and this time, I was the one who missed out. We didn't stop there. After catching up with the brains behind Le Bun (Tim Talbot and Andy Taylor) we just couldn't resist even more food. So out came three sliders and Le French Onion Dog - the first three were 'down in one' affairs (see the boys about to get stuck in) and the dog we shared, all grinning beatifically. Also, who fries parsley? It's genius! These guys have got the burger thing down, I'm a total convert. They're sticking with The Three Compasses for a while and are also running Taco Tuesdays (self explanatory, right? ), Steak Frites nights on Wednesdays complete with Red Wine Roulette and a toasty winter garden to wrap up in. Whilst you're out there, try one of the crazily moreish winter warmers from Kamm & Sons - I fell in love with the Hot Roots so have one for me. 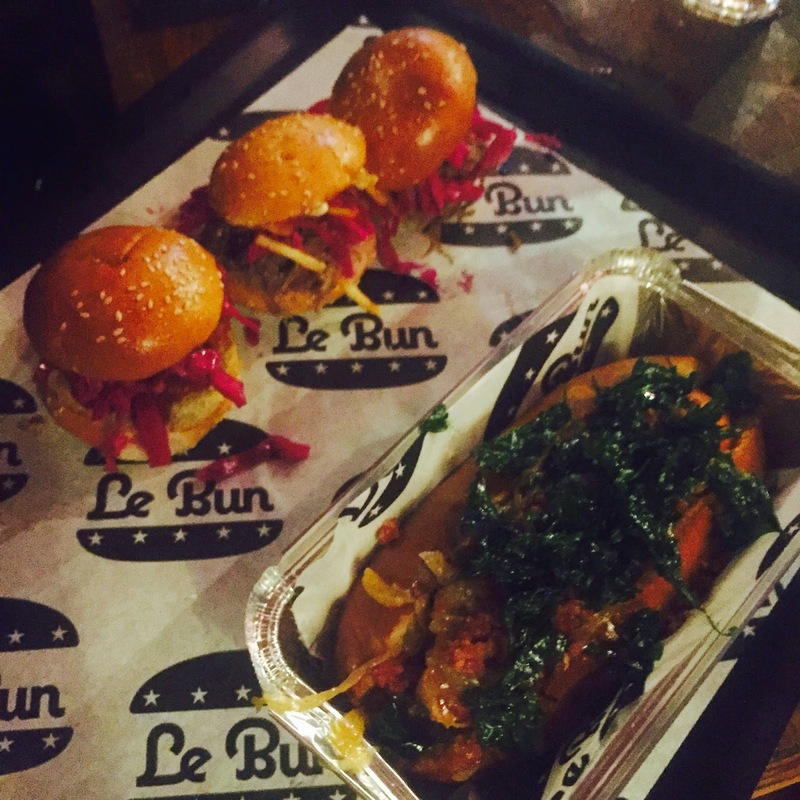 Le Bun, I salute you. Cinq out of cinq. Bravo.